FOR PATIENTS: Show the world you care about Heart Failure and want it improved. In return we will do our best to solve it and know we are doing it for you. Here and on our website, in perpetuity, we will list you and who you are honoring with your donation as a founding sponsor with our sincere thanks. RENT-A-SOCK - get an Edema Sock for a Month to try out. Available in time for the Holidays, help your favorite CHF, Kidney, or Liver disease patient get better and feel better with a nice pair of socks for the month. Finally, some Christmas socks you can really appreciate! We would love to hear what you think as well. DOCTORS: Get our sock! We will send you a fully operational Edema Sock as soon as it becomes available (Expected February 2015.) Note this will be pre-FDA approval and will be for "Informational Use Only" as opposed to clinical or diagnostic. Available in time for the Holidays, we will send a certificate for one device. Help your favorite CHF, Kidney, or Liver disease patient get better and feel better with a nice pair of socks. Finally, some Holiday socks you can really appreciate! We would love to hear what you think as well and include your data in our Crowdsourced clinical study as well. Comes with the App, instructions, and one sock. FOR ADVISERS & INVESTORS: FLY US A CUP OF COFFEE and we will come to you anywhere in the continental US to demo the product of talk about the project and our plans on a deeper level and see how we can help each other out. Let's make your local coffee shop famous as the place where the Edema Sock made its best deal while just a tiny startup. For local meetings, please See the BUY US version above. HOSPITALS: Show the world you care about this problem and want it solved. In return we will do our best to solve it and know we are doing it for you. Here and on our website, in perpetuity, we will list you and your hospital as INSTITUTIONAL SPONSORS with our sincere thanks. We will also send you two Edema Socks for review and testing as soon as they are available. PATIENTS AND DOCTORS: Private consulting on how to improve heart failure monitoring in your office or in your home. We’ll discuss heart rate sensors, smart scales, and edema socks of course. Let us guide you over phone or video chat on how to best monitor heart failure. Up to 10 hours from our team included. PRACTICE PILOT PACK in addition to the DOCTORS reward above, get 5 Edema Socks for you and your patients to try out. We will also include clinical protocols and data trackers and include you as a multi-centered crowdsourced clinical trial site. If all goes well you will be part of the study with appropriate credit on publication and access to the full data set. To get our CHF early warning system online as fast as we can we need your help. Cardiologists, Nephrologists, Endocrinologists, and Liver Specialists are all welcome to join the study although CHF is the first condition we will study. Thank you. CUSTOM DESIGN: Like our design and engineering? Get custom hardware, circuitry and software! Please contact us before backing. HOSPITAL PILOT PACK in addition to the HOSPITALS reward above, get 10 Edema Socks for you and your patients to try out. We will also include clinical protocols and data trackers and include you as a multi-centered crowdsourced Hospital-Based clinical trial site. If all goes well you will be part of the study with appropriate credit on publication and access to the full data set. Nothing will show the efficacy of our CHF early warning system faster than a great hospital pilot. Not since hand washing was invented has there been a less expensive way to have such a tremendous impact on your patients. Reduce your readmission rates, improve patient satisfaction and outcomes, and show the community that your hospital is an EARLY ADOPTER of Safe, Inexpensive, and Better innovations for their health. Our Bluetooth connected sock automatically measures swelling, or peripheral edema, in a patient’s foot. Swelling is a key indicator of how well your heart is pumping and how effective your medication is. Do 1 million Heart Failure patients really need to be hospitalized this year? Each year over a million Heart Failure patients are hospitalized, frequently because of fluid accumulation that causes the lungs and heart to malfunction. To prevent this fluid retention, patients are prescribed diuretics that cause them to urinate out the extra fluid. When that treatment becomes insufficient, water builds up in the legs, and ultimately the lungs. Measuring the volume of the foot and ankle is an effective way of determining when treatments or dosages need to be changed. However, methods for measuring the foot in the home are either cumbersome or inaccurate. 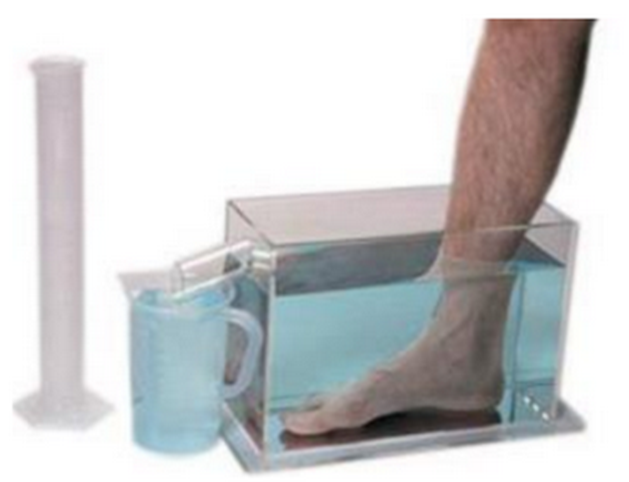 In the method demonstrated in the image below, a patient must fill a bucket with water, dunk his or her foot in, and then measure the volume of water displaced to calculate the volume of his or her leg. Because it’s a pain, and often inaccurate, it isn’t done at all, and many patients end up in the hospital with a condition that could have easily been prevented. Like many problems in healthcare, there is a simple and effective solution just waiting for a crowd of Doctors and Patients to get behind it. With your help, we look forward to making our solution available to all. By using our Edema Sock™ any patient can measure the volume of their lower leg and share this information with their care team. The Edema Sock™ wirelessly transmits data to an App that tracks trends and analyzes the information, generating alerts and messaging everyone who needs to know. With this simple solution the Patient is empowered and the Physician is informed in real time when the patient is accumulating fluid. This information enables extremely responsive care management including diuretic dosage changes that will very likely prevent the need for a hospitalization. The Edema Sock™ is simply slipped onto the leg like any other sock. 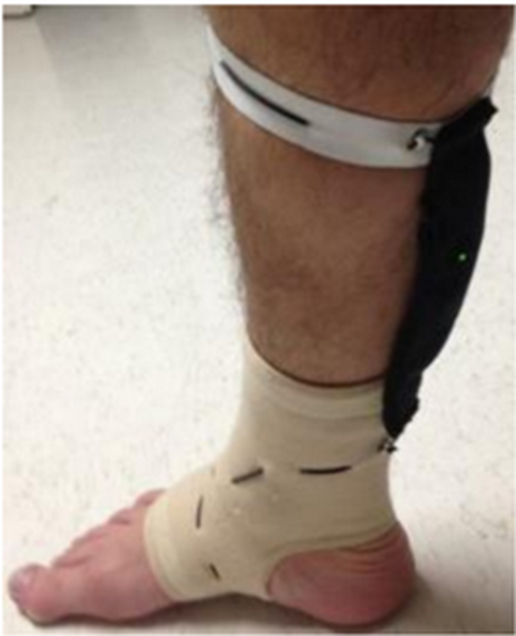 Wrap the band around the calf and the system will quickly measure and send the data to the patient’s iPhone or Android device which will then calculate the exact volume of the lower leg. 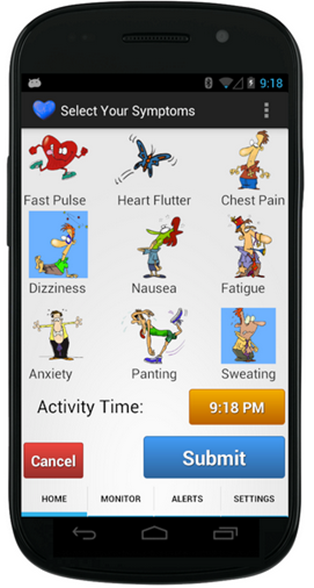 The patient is asked a few simple questions by the App to determine if he or she is having any other heart failure symptoms that day, and that’s it. 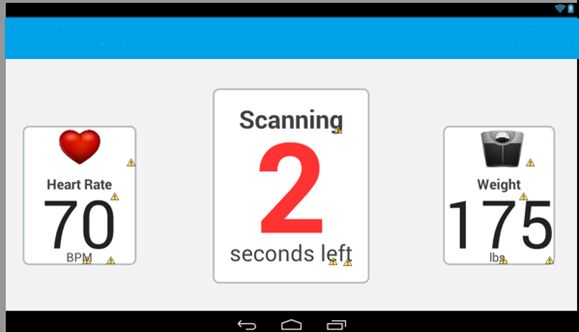 The system has all the information it needs for the EdemaSock™ app to calculate trends and generate alarms and reports as needed. Our App also seamlessly integrates with a wireless integrated scale and heart rate monitor where it is processed and correlated with other metrics for the best diagnostic data. Trend analyzing algorithms can then quickly assess and inform the patient, loved ones, and care providers if there is a growing issue, before it becomes and emergency. If anything is out of normal for the patient, his or her doctor is altered and can make the necessary changes in therapy. Our invention, the Edema Sock, is designed to improve home HF monitoring for both patient and healthcare provider by guiding therapy. The Edema Sock is slipped on the foot and leg like an ankle brace, electronically measures the volume of the foot, and transmits it wirelessly to a Smartphone. The Smartphone app asks the patient about any new symptoms, and transmits the results and leg volume to a cloud that is accessible by the patient’s doctor. The daily information can be trended for comparison to the patient’s baseline, and used to determine if the patient’s therapy is sufficient, or if he is decompensating. Furthermore, the device can be worn overnight by the large HF population which also has sleep apnea. By measuring leg volume changes in real time, the Edema Sock can determine how much fluid is exiting the leg, returning to the pulmonary circuit, and causing the oxygen desaturations associated with sleep apnea in HF patients. The Edema Sock provides context to the daily weight measuring to determine if weight gain is being caused by fluid retention. It will enable us to prevent decompensations and rehospitalizations, reduce mortality, and improve symptoms, functional status, and quality of life. We currently have a functioning prototype, with US and international patents pending. We have partnered with a medical industrial design firm to complete patient usability testing, and to perfect and manufacture the design. Additionally, we have contracted with a regulatory consulting firm to prepare our 510K submission for clearance by the FDA. We have raised $500,000 of capital in a seed round. We are in the process of setting up a clinical study, and are beginning to explore opportunities to work with distribution partners. Cardiologists, healthcare investment bankers, and an insurance reimbursement specialist have been impressed with our market, the value of the device, and the progress of development. Furthermore, we surveyed a small group of patients who believe our system would be more enjoyable and less cumbersome to use than what they currently use. Getting to the finals of this competition is a great validation of our concept, as will be the support of the people and organizations we hope to serve that we hope to gain here. Our prototypes have been tested in the lab, but not yet in a clinical trial. If you would like to obtain an early Edema Sock for your patients, yourself, or a loved one to become our early beta testers for informational use only please sign up with the options at the right. If you follow our clinical protocols and document everything through the app to ensure the best data, your data could also be included in our crowdsourced clinical trial dataset! This is the future of medicine and it is happening with dozens of new ideas already. We look forward to your active and critical participation. Please note, a crowdsourced clinical trial is not the same as the more rigorous scientifically controlled one, but they are becoming more accepted by the medical community and especially patients every day. One of our goals of this campaign is to fund the actual clinical trial needed to get the Edema Sock to market and available for potential CHF patients everywhere. We are preparing the documentation to submit our device to the FDA for Class II clearance. Due to the nature of our invention we do not need to go through the lengthy and costly premarket approval (PMA) process. We expect to be ready to submit this to the FDA for its clearance by February 2015. The AHA2020 Impact goal is audacious and will take many great ideas. We believe we will be one with a significant impact. Heart Failure is one of the most common diseases in the US, affecting approximately 5.1 million people, and causing 1 in 9 deaths (CDC Data by Go, et. al..) HF is also the cause of approximately 1 million hospitalizations and emergency department visits each year, a significant portion of which are preventable. Cardiac arrhythmia, respiratory emergencies, hypertensive emergencies and subsequent stroke are all common life-threatening consequences of the heart beginning to fail which could be detected earlier and reversed with a system that could show volume retention and overload. This is exactly what the Edema Sock™ does and exactly what it could prevent on a massive scale. Could we stop that 1 in 9 Americans from dying before their time with our early warning system for Heart Failure? Absolutely, that is our goal. Anyone who has been on diuretics, or loved someone who is on them, knows how hard it is to get it the dosing just right. Being stuck at home once every three days because the dosages are not optimized doesn’t just reduce quality of life, it also isn’t the best method of determining medication amounts and therefore treatment. By monitoring the fluid volume status of people with CHF in a way that enables doctors and patients to prevent – rather than react to – volume overload, we can drastically reduce preventable hospitalizations, as well as reduce the symptoms of heart failure. Most importantly, having edema under control gives people peace of mind, let’s patients feel better and get back to the important business of living their lives, better and longer. Edema of the foot is not just an early warning sign for Heart Failure, but also kidney or liver failure, certain infections, blood clots, other heart problems, and severe obesity. Edema Sock™ is a great help to doctors and patients for all these conditions. Not having enough information to make a decision is one of the greatest frustrations doctors, nurses, clinical care managers, and care givers of all varieties face. By using our device, care teams are better equipped to determine when patients need a diuretic titration or diet change, so that it can be done before a trip to the ED for emergency diuresis is necessary or worse. We don’t need to tell you the benefits of being able to give better care with better information. What we would like to tell you though is that we need your help to bring this idea to you and your patients. Breaking with the traditional “build it for millions and charge thousands” approach, we intend to offer the Edema Sock™ for a very reasonable price, so low that patients who want to feel their best won’t wait for insurance companies to decide if they need it first. This will not only reduce the cost of care and make your care better, it will start to fix what is wrong with our healthcare system. If this sounds great to you, please sign up for our EARLY ADOPTER reward for Care Teams, follow the protocols as indicated, and help us collect as much data as possible. You can get a few edema socks and run your own mini-trial which we will include in the overall data set for the crowdsourced portion of our study. We will give you access to the data and results and name your practice of center in the study and on our website. Buy five or more Edema Socks for your patients and we will also include a profile for your practice or medical center in our list of participating centers of excellence. And thank you for your assistance in bringing this idea out of the lab and into practice. Note: The Edema Sock™ is not approved by the FDA for diagnostic use, it is for informational use only. While we pursue the approval of the FDA for clinical use, for now it is not approved as a diagnostic indicator. Please also utilize and rely upon traditional means. Every CHF patient should have an Edema Sock™ and we know that working with hospitals is the best way to make this simple device as ubiquitous as it is useful. Patients with an Edema Sock™ will be better cared for and will have better outcomes just like heart rate monitors and pulse oximeters improved care twenty years ago. Then, every patient can leave the hospital with an Edema Sock and stay connected to their care team, reducing readmissions and improving outcome. Be the first HOSPITAL EARLY ADOPTER and show the world you care about reducing the mobidity and mortality of CHF, Kidney Failure, and more through this simple, low cost innovation. We would also love if you would sign up to be a full participant e in our early clinical trials. To do so, please see the reward at the right entitled “CLINICAL TRAIL – HOSPITALS” and be part of the solution. What Can We Do For Pharmaceutical companies and drug development? Have a new diuretic or HF drug and want to quickly and accurately measure its effects on reducing edema with far greater sensitivity than just a bathroom scale? Then do we have a great idea for you. Get the PHARMA PACK reward at the right and let’s help you collect and record data better than ever. Want the Edema Sock on your shelves, website, catalog, or other distribution channel? We are open to signing up distributors and exclusive deals for the Edema Sock by region, classification or country. Please see the DISTRIBUTOR PACK options at right to get that going or email us for more information. Don’t see the deal you like? That’s fine, let’s talk. We know our idea can inspire many physicians, partners and collaborative organizations to get involved. We have been fortunate to have gotten this far with the help of such organizations. We know that many of you can imagine how we can help your patients, practice or company in other ways. Please reach out to us and tell us what you are thinking or post a comment here on MedStartr and let’s start the discussion. Want to talk about becoming an adviser or investor? We will use the proceeds of this campaign to keep refining the product and apps, integrate with hospital systems, fund clinical trials, and prepare for marketing and distribution. We have raised 500K in seed capital and are planning a Series A for the Spring.